Sleep apnea, which is a sleep disorder characterized by abnormal pauses in breathing (and often accompanied by loud snoring) is an ongoing health issue that affects people all over the world, and can lead to higher risks of hypertension, heart attack, stroke, and diabetes. While there are a number of treatments available for this problem, whether it gets properly treated depends on whether someone suffering from sleep apnea is made aware of the potential problem, and encourage to seek medical help. What does this have to do with the airlines? If you have ever been a passenger who was awakened in the middle of a red eye flight by someone three rows back snoring like an unmuffled chainsaw, you've probably been affected by sleep apnea. While sleep apnea in the passenger cabin may be an inconvenience, a flight or cabin crew member suffering from sleep apnea may have that condition affect the quality of their work, and the safety of everyone on board. A recent article by two Harvard School of Public Health professors discussed whether some groups are more at risk for sleep apnea. Some of those risk factors include poor air quality, a factor that many air crew may be exposed to in the workplace. 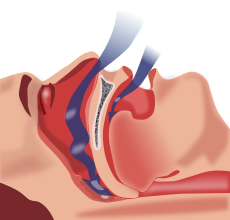 Please review the sleep apnea article and leave your comments on how sleep apnea may have affected you as a passenger or crew member. While the article focused on health disparities faced by low income populations, the flying population may be another population with increased risks. Your inputs may shed light on this issue. While sleep apnea has been a long term concern of the FAA, my interest in the subject today is sparked by one of the two authors of the Huffington Post article on sleep apnea. Dr. Michelle A. Williams is not only the Chair of the Department of Epidemiology at the Harvard School of Public Health, she's also my wife. This was also the very first blog article she has ever written, and it ended up on the home page of the Huffington Post earlier today. We've actually have been learning from each other's profession for several decades, but this is the first time I've ever mentioned her by name. Clearly that's exactly what I call a fascinating article! Do you use this blog for your personal purposes solely or you have it profit wise?